Found in FNA Volume 19. Treatment on page 73. Mentioned on page 74. Plants 5–35 cm. Leaves basal; petioles 0.5–9 cm; blades oblong-oblanceolate, 2.5–23 cm, bases cuneate, margins pinnately lobed (lobes ovate), spinulose-dentate, apices acute, faces hirtellous and/or finely stipitate-glandular. Heads borne singly or 2–3 together (on scapiform peduncles). Involucres turbinate, 14–17 mm. Phyllaries in 2–4 series, lanceolate to subulate (3–15 mm), margins glandular-hairy, apices acuminate, abaxial faces glandular. Receptacles reticulate, hispidulous. Florets 25–53; corollas pink or lavender-pink, 12–22 mm. Cypselae fusiform to linear-fusiform, 4–8 mm, stipitate-glandular and/or hispidulous; pappi tan or white, 1–17 mm. 2n = ca. 54. Phenology: Flowering year round (mostly Mar–Aug). Tex., Mexico (Chihuahua, Coahuila, Hidalgo, Nuevo León, San Luis Potosí, Tamaulipas). 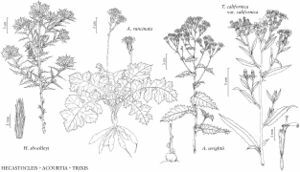 Acourtia runcinata is the most widespread species of the genus, within which it is unique in possessing fasciculate, tuberous-fusiform roots. In the flora, it grows in central and southwestern Texas.